I'll be there. Happy with either ACW or Napoleonic. My preference is always for Napoleonics these days as long as I'm not roadkill again. Would any of the Red River maps work as either wintery Austria or wintery Germany? Or Russia? Most of the western maps are highly forested. Prairie Grove has an non-forested central area. Otherwise I was thinking of one of the Random Maps 6. I thought the Pea Ridge battlefield was very open? Had you noticed that Garniers random maps, where the town names are marked there are actually brown squares to denote the base of a built up area. Some of your stone enclosures could go in those so that the towns have more functionality. I actually replace his towns with my own, but placing the stone enclosures in those spots is a good idea. My towns are all at road junctions so they are easy to locate. I might join later if you havent started yet. Our dinner is very late today But dont wait for me. Yesterdays game was really a learning exercise for me. - I overestimated the maneouverability of a full divison. How long it takes to redeploy such a force. - Suchets and Martins Divisions were positioned so that they couldn't have a sight on all their troops as there were woods between. - Sometimes I gave direct orders to troops in danger, without informing its division cmdr. - I underestimated the lines of communication and how long it takes for orders to be carried out. - Twice I sent orders to Digby but before the courier even arrived I realized that the situation had already changed again and a different order had to be sent, counterordering the previous courier. - I panicked when there were reports and signs of Austrian units in my rear. As it turned out it was Kevin, but only with a small division. It was a lot of fun though, my congratulations on the performance of the French players Suchet, Digby and Martin under the circumstances described above and facing an enemy of double strength! This was a very messy battle that went from an apparently stable, in-control situation to complete chaos very quickly. Given that our 18,000 French were facing 30,000 Austrians and the scenario had originally been designed for a players (Fr) vs AI (Aus) co-op style I think Stefan did very well. 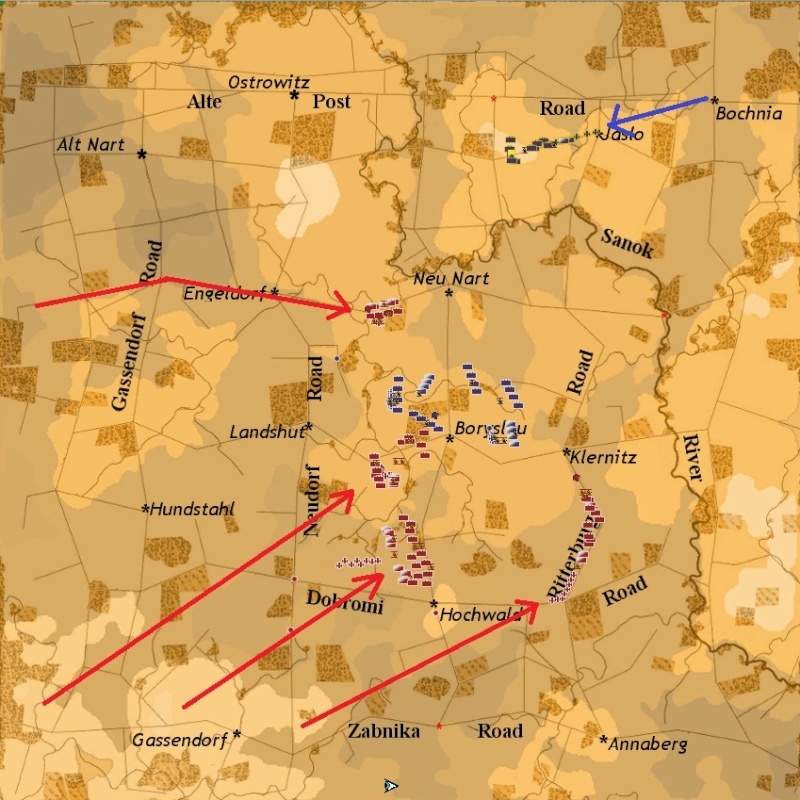 Perhaps our biggest fault was to try and concentrate forwards on the objective where we quickly became outflanked on both sides, rather than give up the objective, fall back north to our reserve division and make a concentrated stand on higher ground, to either defend there, or attack later on in a stronger force. It was always going to be a tough game for the French, so I agree with Diggers that you shouldn’t be so hard on yourself. As well as being outnumbered, a third of the French started the game a long way to the rear. The Austrians also had more (and better) cavalry. The French had better quality infantry though. I tried to design it so that it could either be played vs the AI (as the Austrians), or between 2 teams of 3. It may be that was a stretch too far. I did intend that one small independent Austrian division in the NW would be under AI control, but with 8 players that didn’t happen. It may have made things more difficult for the French. Here is the position about 35 minutes into the game. At this point, it appears the Austrians are on the verge of achieving a Cannae! In the event, the French managed to withdraw N to a position around Neu Nart, where their eastern flank was supported by their newly-arrived third division. The main battle was fought in that area. Useful map. I could not be sure if the eastern flanking Austrian column was east of the Sanok or coming up the Klernitz road. Distances are deceptive. I knew we were going to have trouble from our left soon so I was pretty shocked to receive Stefan's order to abandon the east flank of our position - my cavalry is on the 'au' of 'Borislau' and my two inf brigades are north of there - and to march right across behind Suchet to attack Kevin's division near Neu-Nart. I knew this move would take me a good 15 minutes at least and given how much white was massing in front of Suchet by then I didn't think he'd hold out long enough. In the event we did hold it together, just, but I think his division was pretty knocked about. Mine was wrecked completely; I had only 2 battalions and my battery left at the end. If this had been a campaign game it would count as a crushing Austrian victory - I doubt the French would have got anything of mine and Suchet's divisions away. One of the good things about HITS is that you can never know the overall position, so sometimes small forces can stop and delay much bigger ones, and big forces can act cautiously. Its a feature of the confusion of real battles which you lose entirely once you raise the player camera height even just a little, like 25 or 50 metres. Digby wrote: I knew we were going to have trouble from our left soon so I was pretty shocked to receive Stefan's order to abandon the east flank of our position - my cavalry is on the 'au' of 'Borislau' and my two inf brigades are north of there - and to march right across behind Suchet to attack Kevin's division near Neu-Nart. I knew this move would take me a good 15 minutes at least and given how much white was massing in front of Suchet by then I didn't think he'd hold out long enough. My orders from Mitra were to attack everything in my front and keep attacking. My inconsiderable force might have lasted 5 minutes. Instead I tried to place myself in a spot that would worry the French and tie up a force larger than my own. Imagine my pleasure when I saw those blue and white clad soldiers marching in my direction. The pleasure didn't last long when I saw those troops stop only briefly before continuing on with close support from a large number of dragoon. Have I ever commented, I hate cavalry? It is one thing to run up and slap a grizzly bear and quite another to escape with a whole skin. Once Digby's infantry and cavalry started working in concert, masterfully I must say, I was sure I would spend a large part of the battle riding around, observing, as my command was not long for the field. Now imagine my pleasure when those troops suddenly turned around, broke contact and vacated the field. Although I only had one battalion of grenadiers and three squadrons of hussars available, I scared away a force twice my size. I am sure those hoards of white uniforms cresting the hills to the south and east had little to do with it. I must note that those white uniforms stopped for quite a while to dine on bratwurst and beer while I was being pummeled. Something curious struck me about this map. Look how long the red lines are that show how far the Austrians have moved. Now look how short the blue line is showing how far Martin's division has moved. That must be one hell of a muddy road. First there was the late morning brew-up, then tiffin, followed by lunch and high-tea. The latter was rudely interrupted by orders to march. My chaps were in quite a tizz about that, I can tell you. No excuses Martin, your general had an extremely short name this time.